We are excited to partner with a group of bloggers to give away this exciting prize pack! 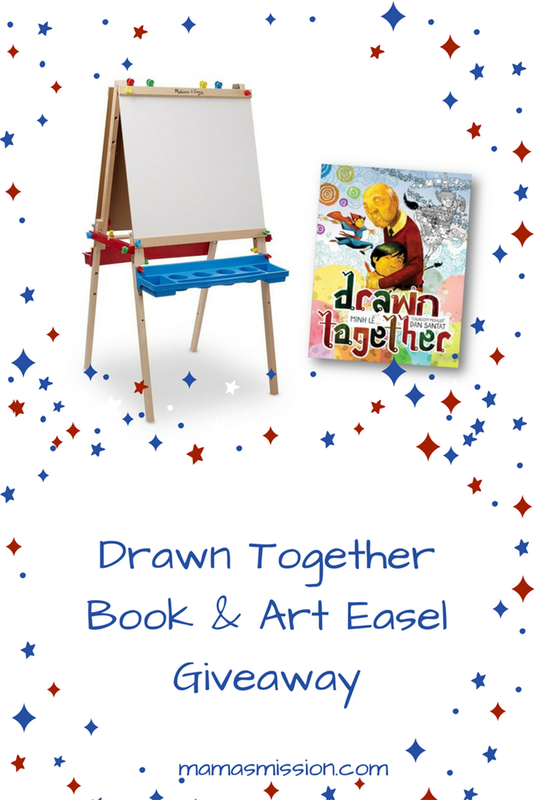 One lucky winner will win a Drawn Together hardcover book and Melissa & Doug art easel! Author Minh Lê and Caldecott-winning illustrator Dan Santat join forces in a heartwarming story of a grandfather and his grandson as they learn to overcome their language barrier through a shared love of art and storytelling. When a young boy visits his grandfather, their lack of a common language leads to confusion, frustration, and silence. But as they sit down to draw together, something magical happens—with a shared love of art and storytelling, the two form a bond that goes beyond words. With spare, direct text by Minh Lê and luminous illustrations by Caldecott Medalist Dan Santat, this stirring picture book about reaching across barriers will be cherished for years to come. Drawn Together is recommended for children ages 3-5 and you can find more great picture books for young children here. What lessons have you learned from your grandparents or others about being Drawn Together without using words to communicate? One lucky reader will have the chance to win the Drawn Together prize pack, as mentioned above, ARV $100. The Drawn Together giveaway will run from the time posted until 11:59pm EST on 6/25/18. All entrants must be at least 18 years of age or older and residents of the United States. You must use the Rafflecopter below to enter. Good Luck! Disclosure: The materials, above mentioned prize, samples and/or compensation, were provided to Mama’s Mission by Disney Hyperion for sharing this information and giveaway. The sponsor of this event will be responsible for fulfillment of prize. The prize may be sent via FedEx or USPS. No P.O. Boxes please. Only one entrant per household (ip address). One winner per household, email address, IP address or home address. Winner is subject to eligibility verification. No purchase is necessary to enter. Void where prohibited by law. The odds of winning are based on the number of entries received. All entries are optional; however, the more tasks you complete the greater your chances of winning. Confirmed Winner(s), via Random.org, will be contacted by email. Winner(s) have 48 hours to respond before a new winner is chosen. This event is in no way associated with, sponsored, administered, or endorsed by Facebook, Twitter, Google, Pinterest or any other social media network. The disclosure is done in accordance with the Federal Trade Commission 10 CFR, Part 255 Guides Concerning the use of Endorsements and Testimonials in Advertising.